One of the many things I loved about living in North Newton, and so close to Bethel College, was the fact that the chimes on campus accompanied me on my walk to church every day, and sometimes on my way home. These bells became my friends; they helped me mark time and sometimes, they called me into a spirit of worship. Fortunately, for me, there is a nearby church that has a bell tower, so my days aren’t as lonely as I feared they would be here in Kansas City. I have my chimes so I’m happy, a good part of the time at least. Speaking of bells and chimes, Ive been doing my own ringing of bells. 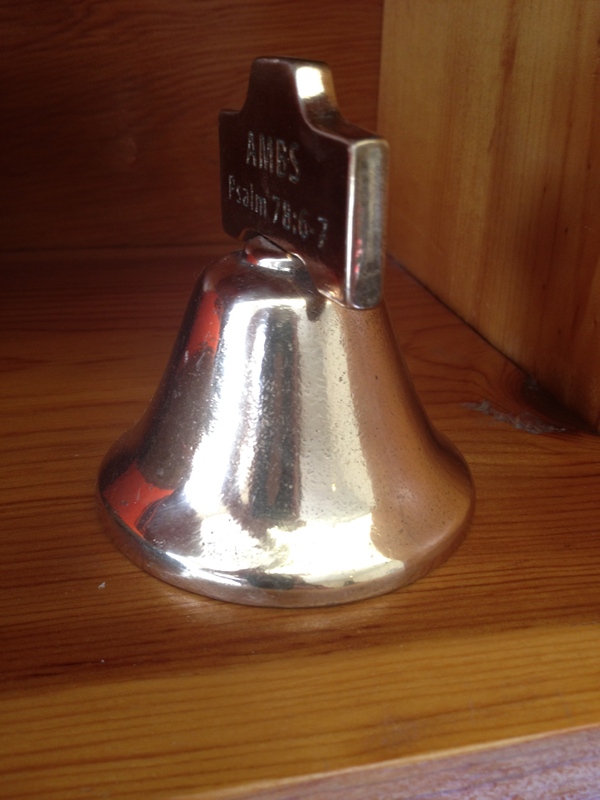 Pictured here is a bell I received when graduating from seminary. I’ve decided to ring it every time grant money is received for Freedom School. Click here for more information about this amazing program that Rainbow has the privilege to host every summer. Rachel Hostetler, our community service coordinator, works hard at writing grants. Ringing a bell is the least I can do to support her in this important, if not challenging work. I was happy to ring it last week when a grant in the amount of $10,000 arrived. Who knows, maybe I’ll also ring it every year if and when we meet our annual budget. So let’s keep listening for the bells that announce good news, that call us into worship, and that help us mark time!